Are you ready to suit up for sports? Mouthguards have been called the most important part of an athlete’s uniform. Designed to absorb and distribute the forces of impact received while you participate in athletic activities, your mouthguard is a protective appliance that covers and cushions your teeth and gums to prevent and reduce injury to your teeth, jaws, lips and gums. A properly fitted protective mouthguard is comfortable, resilient, tear resistant, odorless, tasteless, not bulky, fits well, and has sufficient thickness where needed. If you wear it when engaging in contact sports it can prevent injury, pain, suffering and years of expensive dental treatment. 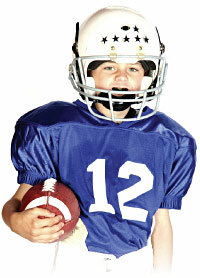 The American Dental Association recommends the use of custom mouthguards in 27 sports/exercise activities. Contact us today at (248) 589-2021 to schedule an appointment to find out more about mouthguards. Filed under mouthguards . You can follow any responses to this entry through the RSS 2.0 feed. Both comments and pings are currently closed.